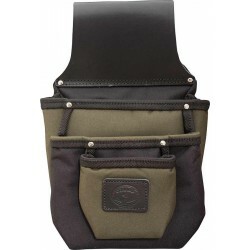 Three Pocket Pouch – A large multi-purpose pouch with three generously sized pockets measuring 24cm x 21cm, 20cm x 16cm and 13cm x 10cm The main body of the pouch is made from padded olive green and black woven polyester and features an extra wide ‘belt loop’ section made from premium grade black leather for extra durability The pouch is rigid enough to stand upright on its own if you prefer not to have it threaded onto a belt whilst working ..
Multi Pocket Pouch – The first of our brand new designs! 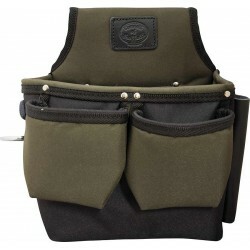 This large multi-functional padded pouch features a total of five polyester pockets and eight leather tool loops The large main pocket measures 24cm x 21cm and has a handy deep internal pocket measuring 12cm x 14cm with wire support in the opening for easier access There are three further smaller external pockets and four leather tool loops The pouch has an extra wide ‘belt loop’ section made from premium grade black leather for extra..
Steel Fixers Pouch – Our new design of Steel Fixers Pouch has a wide opening, large, padded main compartment measuring 23cm x 16xm x 6cm for nuts and bolts etc. 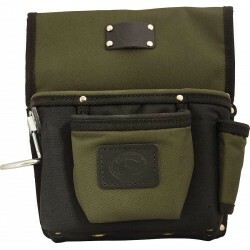 With three internal loops for holding steel drifts There is an additional smaller outside padded pocket which is the ideal size for a tape measure plus a spanner holder and a nickel plated hammer holder ..
Electricians Tool Pouch – a large, wide opening padded Electricians Tool Pouch with numerous internal and external pockets The main pouch measures a generous 25cm x 20cm x 10cm and has seven internal loops for various sized screwdrivers plus four ‘fold flat’ pockets for a multi meter, voltage tester and pens or pencils etc. 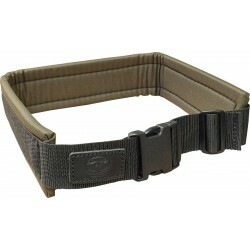 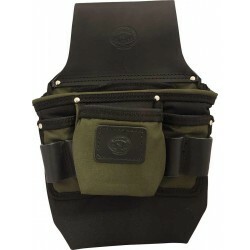 There are two external padded pockets which are the ideal size for a tape measure or other small items plus a nickel plated hammer holder mounted on one side of the pouch..
Padded Belt – A 2” wide comfortable, padded olive green and black belt with strong, quick release fastener Designed for use with all our polyester tool pouches Fits up to a 44” (112cm) waist ..